Like a lot of health trends yoga began as just another hippie fad. But in recent years increasing numbers of scientific studies have found proven benefits to practicing yoga. Yoga allows the body to recover and heal more quickly from a variety of stresses and illnesses by strengthening the vagal tone or relaxation response associated with the vagal nerve. "So what's the vagal tone all about? It's directly related to the state of the vagus nerve, which is our largest cranial nerve. It's also known as the "wandering nerve" because of its mobility through the body. The vagal tone starts at the base of the skull and travels throughout the body, touching the respiratory, digestive, and nervous systems. Often thought of as our "air-traffic controller," the vagus nerve helps regulate all our major bodily functions. Breathing, heart rate, digestion, and even how we take in, process, and make meaning of our experiences are all directly related to the vagus nerve" (Reference). So just who are reaping these multiple system, body-wide benefits of yoga? There are classes and practices geared toward everyone from military veterans to teens and children. Recently, the Cleveland Clinic became the first hospital to hire a full-time yoga therapist and program manager, and other hospitals in the nation are also starting to offer yoga. 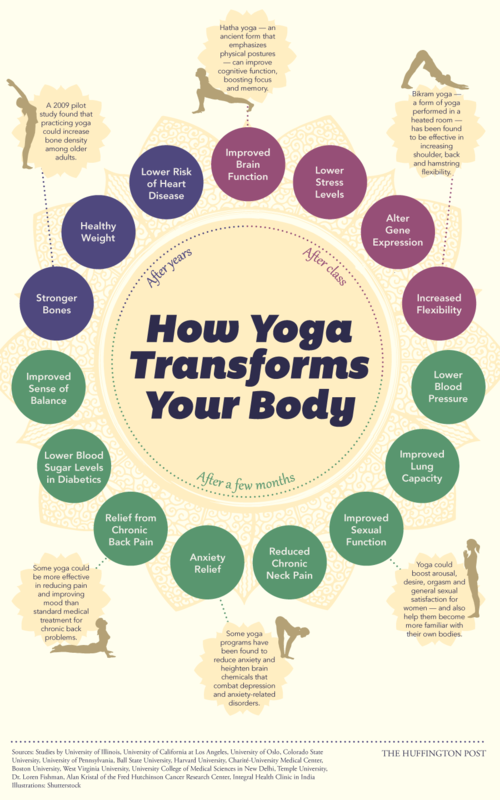 For more on the benefits of yoga, check out the little infographic below (courtesy of Jan Diehm for The Huffington Post)!